Last week I attended 2/3 of my kids’ back to school night. Every time I visit their school, I wish I had attended it myself, and I wish that I was teaching there. It’s one of those learning environments that was designed to teach not just content, but responsibility and risk-taking. It was a surprise, actually, that the opening topic of the evening was the anti-bullying program they are implementing, the Olweus Bullying Prevention Program . A surprise because I would have thought they already had a bullying policy…and in truth, they did. But a policy is not a program; a policy gives behavioral guidelines and usually consequences, but doesn’t create a community that knows how to identify destructive behaviors or has the skills to hold others accountable. A policy tells you what to do, but not how to do it. Policies may work, but only if the community exists with the power and skill to reinforce the policies fairly. And so, the school had decided to implement a program for the kids, staff and parents to all learn the “how” of handling bullying situations at the school. Lurkers: probably the most benign, lurkers join communities and benefit from the contribution of others, but don’t contribute themselves. Lurkers don’t usually intend to cause harm, but when situations arise that they leverage information or knowledge gained from the community, they are in essence community vampires. Don’t confuse lurkers with peripheral participants; often when new members join a community, they observe for awhile before they get comfortable and start participating, or decide to leave. Lurkers know they are taking from the community while not contributing and operate under the assumption that that’s ok.
Trolls: usually refer to people who leave rude or offensive comments on public forums like message boards or blogs. Trolls may also just say inflammatory things to try to pick fights with people. Trolls want attention, and they seek it through negative interactions. Trolls are destructive to a community when they can derail conversations and deter people from contributing for fear of being targeted by the troll. Griefers: typically griefers are seen in 3D immersive environments, where avatars can actually disrupt communities by taking action against other community members. Griefers may stick to audio or visual distractions, or they may actually take action against others. One popular griefer trick in Second Life was to “cage” people’s avatars, so your only course of action was to log out of the environment. Similar to trolls, griefers seek negative attention and their goal is to disrupt community interaction. Stalkers: while stalkers typically focus on disrupting or seeking attention from an individual, they can impact communities because they leverage community tools to get to their targets. People who participate in open social media communities provide ammunition to these individuals who use publicly posted information to try to hurt an individual. Stalkers typically function using harassment: name calling, threats, responses to specific details of a person’s life. These types of people not only hurt individuals, they hurt our communities by creating a dynamic where people stop contributing to avoid making themselves susceptible. When a community becomes infected by an online bully, the community typically struggles both in how to deal with the bully and how to support the victim(s). What Olweus gets right in his bullying prevention program is that dealing with the bully is not enough; you have to support the victim if you want to community to feel safe to all of the members. Its never just the victim impacted by someone’s bad behavior, everyone is impacted. If someone sees that bullying is left unchecked, even if that person isn’t being bullied, it sends two messages: this behavior is acceptable to this community and if someone does this to me, I won’t be protected by the community so I need to protect myself. Typically that results in withdrawal from the community, or limited participation. The imbalance of power in online bullying is an important consideration. Anonymity on the Internet still abounds and people take actions without taking ownership quite often; lurkers, trolls and griefers leverage anonymity to harm others without personal consequence. Even when the bully isn’t anonymous, other things can be leveraged to gain a perceived advantage, such as stalkers threatening their victims with vague or sometimes real personal consequences. Communities have the ability to remove the imbalance of power by consistent and respectful reinforcement of their policies and by keeping communication open. Modeling expectations is key and playing through scenarios to establish expectations for community member behavior can help demonstrate policy concepts in practical application. One important distinction is the difference between bullying and conflict. If there is a conflict, then the involved parties should be able to work out their differences without the intervention of the entire community. Mediation may be necessary, but as adults, we should be prepared for conflict to arise and to actively work to resolve those conflicts, not leave them to the community to manage. 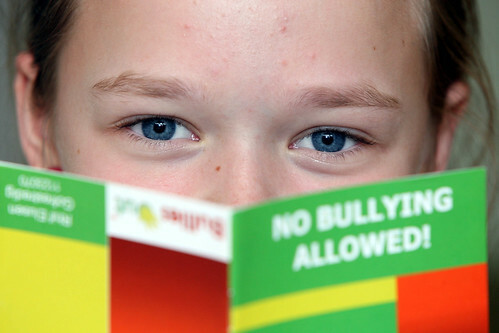 Bullying, as noted in the definition, involves repetition, intent and an imbalance of power. It is in those instances that behavior shifts from conflict to bullying, and becomes a community management issue, not simply a personal conflict to be resolved or mediated. As more and more learning occurs in online communities, holding people responsible and accountable for their interactions with others online is a new skill…or maybe just an extension of common courtesies that our parents tried to instill. Here’s what my mom taught me: Treat others as you’d want to be treated. No name calling. Stand up for what’s right. Don’t say anything about someone you wouldn’t say to their face. Don’t write anything you wouldn’t want your grandmother to read. I had a pretty progressive grandmother and she’d be tickled to see how technology and innovation have evolved to allow for people around the world to talk, work and collaborate together. Still, she went to etiquette school and often talked to me about what it means to be a lady and how gentlemen should behave. As my involvement in social and game communities expands and evolves, I think about the values I’ve been taught and how the examples that we set for our behavior in real life and online reflect the values of who we are and shape the communities to which we belong. Communities, as a group, thrive best when they share these same values and establish behavioral norms that create each community’s culture. These should be mindful and ongoing discussions, not assumed or ignored. In learning communities, whether they be physical schools that our children attend, online communities where members share knowledge and experiences with one another to support our continuing education, or serious game communities where people support each other in changing behaviors, the community goals are the same: create a supportive environment where its safe to take risks and learn from each other. For learning communities, safety is key…if you don’t feel safe, you won’t open yourself up to sharing with others, trying new things or asking questions. For learning communities in particular, bullying and the lack of enforcement of values can derail the purpose of the community, preventing real learning and personal growth from occurring as members withdraw or decide the risk/reward balance of fully participating is not to their advantage. One final note, as this is published on SOPA/PIPA blackout day…what threatens some of us ultimately threatens all of us. Open doesn’t mean without guidelines and freedom doesn’t come without responsibility. There are constant tests of community values and culture, whether in the form of bullies or simply those that have different values or vested interests. Successful, productive and meaningful communities are those with defined values that community members are willing to defend.